Update: I took some more pictures of the cake-assembly process recently – which I hope you’ll find helpful! When I first posted this cake last year (for Chelsea’s 21st birthday), I was reluctant to include the recipe. It is sooooo lengthy, with sooooo many steps (as well as four – yes, four – separate components), that I thought it would be too much. And anyway, you should get the book. Because it’s awesome. Really. But when I made the cake again for Chelsea’s 22nd birthday (girlfriend’s consistent, I tell ya), I got quite a few requests for the recipe. * DON’T be intimidated by the number of steps and all the different components. Yes, it’s a lot. But none of it is difficult (pinky swear), and in fact, the recipes use basic techniques that even the novice baker will be able to execute. In addition, everything can be done in advance, so you can complete each step at your own pace (even the cake itself can be assembled up to 5 days in advance). So if you’re unsure about your results/skill level/confidence, I’d recommend starting in advance and doing a little at a time. It will be less stressful that way (and hopefully even a little fun!). I listed the components in the order that I make them in; feel free to switch it up as it suits you. * This book is one of the very best in terms of clear, easy to follow directions, that pretty much guarantee great results. Yes, you will need a few “specialty tools” (I’ve listed them below and included links for where to purchase). But if you BUY THE BOOK you will use these tools a lot. Trust me. (see here, here and here if you don’t believe me). * There are some ingredients that you probably don’t have in your pantry (at least I didn’t). Some are necessary (like the clear vanilla), others not so much (like the “pinch” of citric acid, or the cake flour – regular all-purpose will work just fine). Everything else is readily available at the grocery store. * One of my favorite features in this book is the inclusion of weights as well as volume measurements. If you haven’t bought a food scale yet (really? come on!! ), this is the time. It streamlines the process beautifully, uses less bowls and spoons, and is way more precise. You can read more about why I heart my food scale here. Okay – here we go! You can ask me any questions you may have along the way, and if you make the cake, send me some pictures! Pre-heat oven to 300. Line a baking sheet with parchment paper; set aside. In the bowl of your mixer combine both sugars, flour, baking powder, salt and sprinkles. Beat on low speed till well combined. Add the oil and vanilla and beat till ingredients are totally incorporated, and small clusters form. Spread the clusters on your prepared baking sheet and bake for 20 minutes, using a fork to occasionally break them up. The clusters will be moist to the touch when removed from the oven and will dry as they harden. Cool completely and use immediately (can be stored for 1 week at room temperature in an airtight container, or in the fridge or freezer for up to a month). Pre-heat oven to 350. Spray a quarter sheet pan with a non-stick cooking spray (such as Pam). Line with parchment paper and set aside. In the bowl of your mixer, combine butter, shortening and both sugars. Beat on medium-high for 2-3 minutes. Scrape down the sides, add the eggs and beat on medium-high for 2-3 minutes. Scrape down the sides. On low speed, add the buttermilk, oil and vanilla. Increase speed to medium-high and beat for 4-6 minutes. Scrape down the sides. Add cake flour, baking powder, salt and the ¼ c. of sprinkles. Beat on low speed for about a minute, or just till the batter comes together. Scrape down the sides. Pour the batter into your prepared pan and spread evenly, using a small angled spatula. Sprinkle the remaining 2T. sprinkles evenly over the top. Bake for 30-35 minutes, or till cake bounces back when lightly pressed and is no longer jiggly in the center. Cool cake in pan on a wire rack. Remove from pan and use immediately, or wrap in plastic wrap and store in fridge for up to 5 days. Whisk milk and vanilla in a small bowl. In the bowl of your mixer, combine the butter, shortening and cream cheese. Beat on medium-high for 2-3 minutes. Scrape down the sides. Add the corn syrup and vanilla. Beat on medium-high for 2-3 minutes. Scrape down the sides. Add the confectioner’s sugar, salt, baking powder and citric acid – beat on low speed till ingredients are just incorporated. Increase speed to medium-high and beat for 2-3 minutes. Use immediately or store in an airtight container in the fridge for up to a week. Place a sheet of parchment paper (or a Silpat) on your counter. Invert the cake over it and peel off the parchment from the bottom of the cake. Using the cake ring, “stamp” two circles out of the cake. DO NOT DISCARD THE SCRAPS! 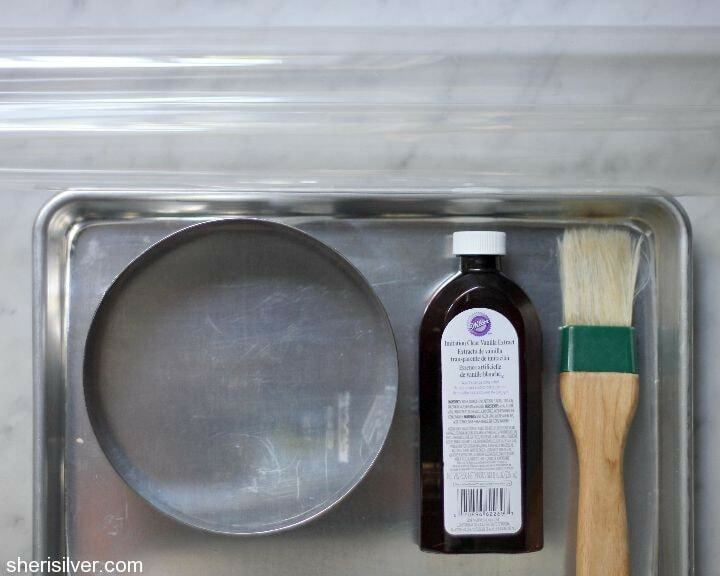 Clean the cake ring and place it on a baking sheet lined with parchment. Line the inside with one of the acetate strips (Note: I’ve received several comments/e-mails from readers having trouble visualizing how to insert the acetate strips. Next time I make this cake I will take more detailed pictures of that step, but in the meantime here’s a link to some good images to illustrate!). 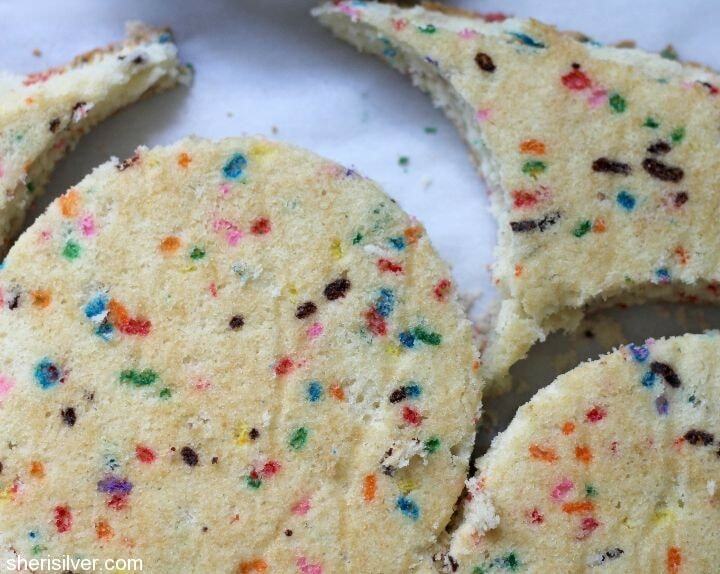 Put all of the cake “scraps” in the ring and press into an even layer, using the back of your hand. Using a pastry brush, soak the cake with half of the cake soak. Use the back of a spoon to spread one-fifth of the frosting evenly over the cake. 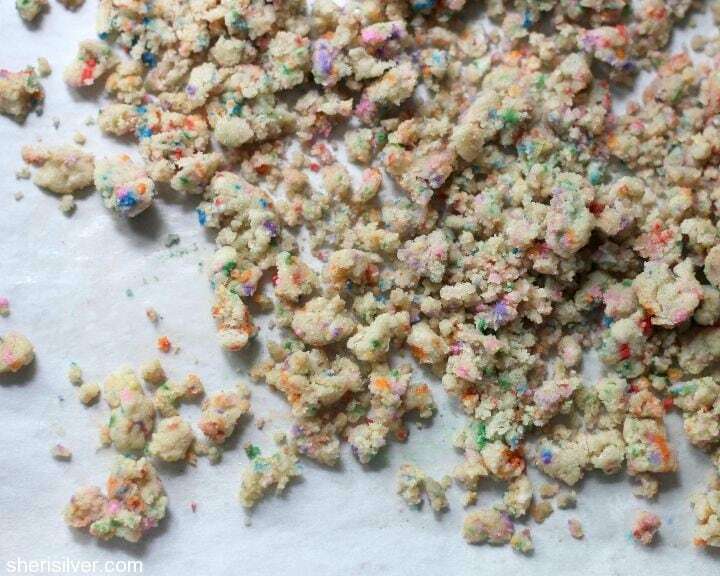 Sprinkle one-third of the birthday cake crumbs over the top of the frosting, using the back of your hand to press them firmly into place. 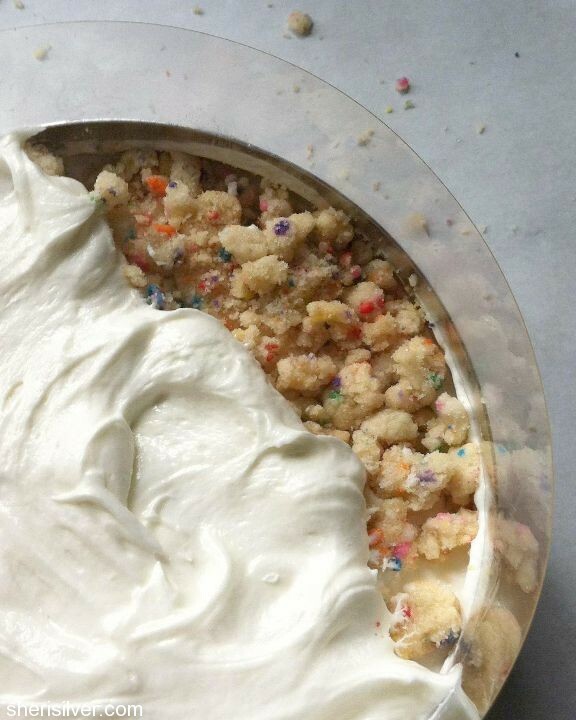 Use the back of a spoon to spread one-fifth of the frosting evenly over the crumbs. Gently tuck the second acetate strip in between the cake ring and the top ¼” of the first strip – you should have an acetate ring that is about 5-6” tall. Gently place one cake round (use the less pretty of the two) on top of the frosting. Repeat the soak/frosting/crumb/frosting steps from layer #1. Place the remaining cake round on top of the frosting. 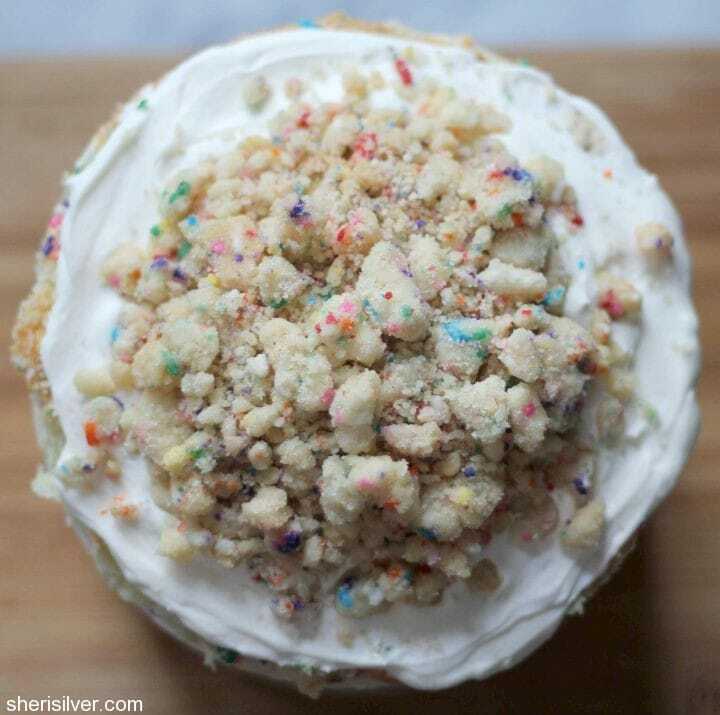 Spread with the last fifth of the frosting and garnish with the remaining crumbs. 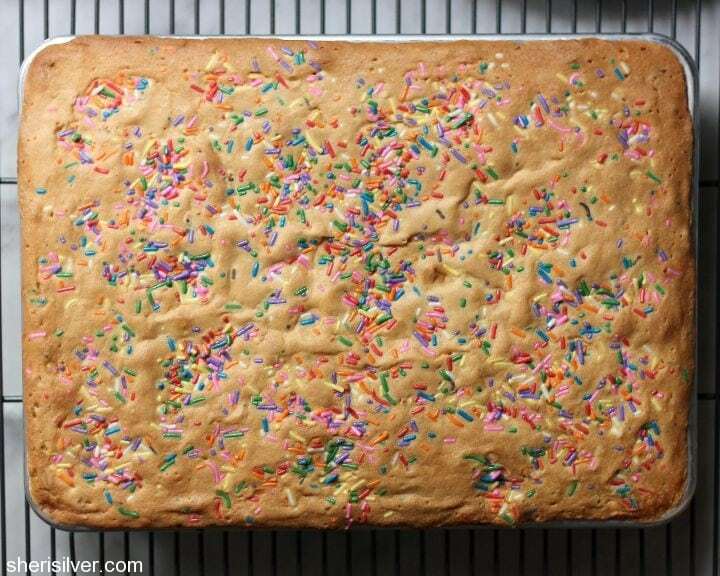 Place the cake – still on the sheet pan – in the freezer and freeze for at least 12 hours (or up to 2 weeks). At least 3 hours before serving, take the cake out of the freezer, and – using your fingers and thumbs – pop the cake out of the ring. Gently peel off the acetate and place in the fridge. If not serving that day, wrap well in plastic and store in the fridge for up to 5 days. You are a rock star of the kitchen kind! Now I must take this to MY kitchen and create a gluten free version. I will let you know how it goes my friend! SOOOOOOO good to see you yesterday and wished we had talked more. You’re amazing… you have so much talent. I found you via the milk bar twitter post about your blog. I love it! I made this cake in May for my husband’s birthday. You’re right – it’s not hard but it does have a lot of steps. 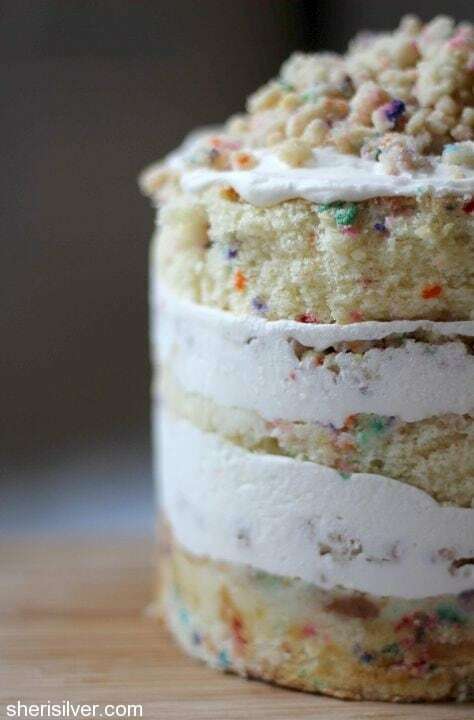 The first time I made a Milk Bar cake I didn’t have a cake ring or acetate strips so I made it work with a 6″ stovepipe (hardware store! $6!) and strips of parchment. Just an idea in case anybody wants to try it but can’t find those supplies! Wow – thank you!! 🙂 I love your ingenuity! And that is great to know about the parchment strips; thank you so much for sharing that!! Sounds wonderful. Two questions though. 1) Is it necessary to use scraps from cutting out the two cake riunds, or could you just use 3 round pans? 2) Where is the other half of the soak used? Thanks! Can’t wait to make this! Do you have pictures of the steps with the acetate strips and the stacking? I am just having a hard time visualizing this part. I, too, am having a hard time visualizing the stacking with the acetate. Would you mind emailing me the pictures as well. Thank you so much! I’ll skip all your hard work, writing, and comments and just take credit for giving you the book. I did, didn’t I?? Do you like the clear vanilla extract? I can’t decide if I want to just make it with regular pure vanilla extract? How about the taste? And I can’t find any 6×3 cake rings available on Amazon. Do you think a 6×2 is fine? 1) How much does the cake rise while baking? I’ll likely need to use a different sized sheet pan and don’t want to overfill. 2) Would it be crazy to make this in a springform pan?? I know things would have to be adjusted because of the size difference, but it seems like getting it out of a springform might be easier… as opposed to pushing it through the ring. Thoughts? I’m about to bake this and have all of my ingredients ready to go. After the cake is assembled, is it covered before placing in the freezer for the 12 hours? Thanks for your great directions!